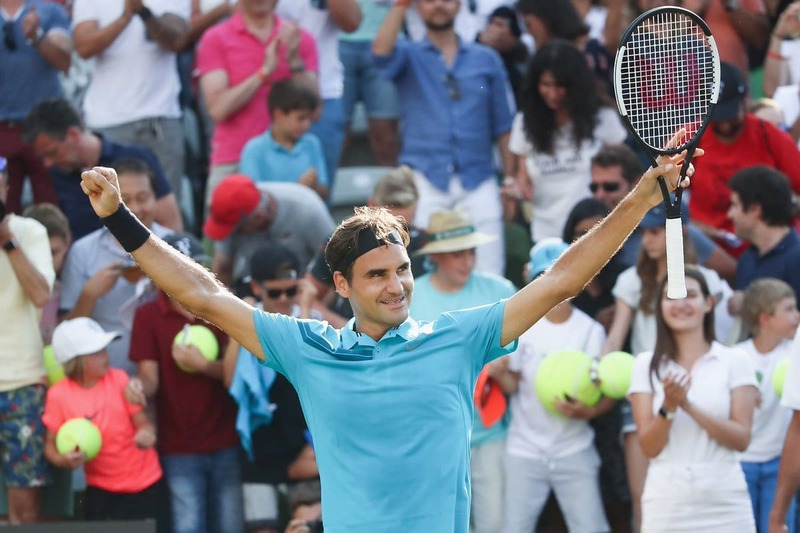 Title Number 98 for the StuttGOAT as Roger Federer secured his first Mercedes Cup title defeating Milos Raonic 6-4, 7-6(3) in Sunday's showpiece. 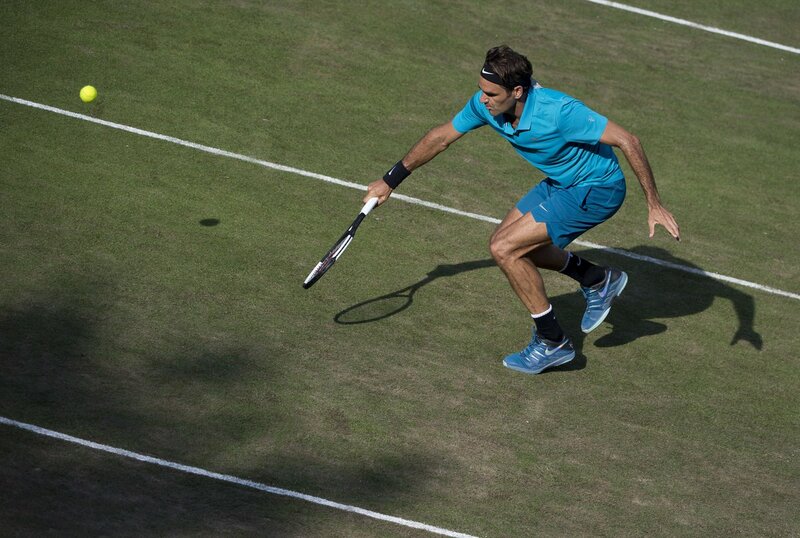 The win sees Roger land his 18th grass court title (imagine how many that would be if grass got a fair crack of the whip during the season) and extend his win streak on the green stuff to 16 matches. Raonic won the toss and elected to serve, holding to 15 to kick off the final. Roger was then twice forced to deuce en route to holding but in game three he began to find his feet, coming up with a slick return for 15-30, a sweetly struck inside-out forehand pass for 15-40 and then a blocked backhand return winner to cap off a peRFect return game for 3-1. With Raonic rarely dropping serve it was imperative Roger consolidated and he did it the hard way, recovering from 15-40 to hold. Digging a ball inches from the floor to thread a forehand pass to save the first break point. GOAT stuff. With the break secured the set continued on serve and at 5-4 Roger served it out in style with a classic half volley pickup on the baseline followed by a ghost to the net to serve it out to love. Into set two and Raonic again started with a confident hold. Roger quickly levelled to love and the set continued to be dominated by serve. The Canadian was able to make a few inroads early having 15-30 in game four and 0-15 in game six but it wasn't until game eleven we'd see a player lose the first point on serve again as Raonic held from 15-30 to lead 6-5. Roger then matched him, holding from 15-30 to move into the tie-break. A timid backhand saw the breaker get off to a poor start for Raonic but he reset quickly, firing a bullet return to recoup the mini-break at 1-1. Roger then held for 2-1 and the pair were able to win both points on their next serves as Roger moved into a 4-3 lead. With the pressure back on Raonic he faltered, double faulting for 3-5 and then the Swiss came up with a high quality passing shot to give himself three match points which he converted at the first time of asking to win title number 98. I'm really happy. I thought it was a good final from my side. I think I played very well throughout the tournament, actually, having not played for a while. It's a great comeback for me. Maybe I was a little bit better on the bigger points. Of course, I'm so happy to have won here, finally, in Stuttgart. He's had 11 weeks off but there's no stopping the King of Grass as he made the peRFect return to the tour to bag his maiden Stuttgart title. Probably his best match of the week in terms of level and shotmaking; the Swiss was dominant from start to finish, playing a brilliant return game to break in set one and being watertight on serve throughout saving the two break points he faced. Some of the half volleys he played too from the baseline were pretty special and being able to fuse that stylish shotmaking with solidity when required proved too much for Raonic who will no doubt rue the double fault in the second set tie-break. He can't have too many complaints though, aside from ramping up his serve in the second set he was second best in all areas with Roger coming out on top in all areas aside from ace count and there wasn't really a moment in the match where you felt he didn't have control of the tempo out there. So a great week, Fed looks sharp and explosive, bags a title and heads into The Gerry Weber Open as Number 1 with a chance to win title number 10. That's a few matches away of course but this week didn't seem taxing physically so he's got a pretty good chance of doing just that. The only negative is the short turnaround time, he'll drive back to Switzerland today to watch football tonight and then fly to Halle tomorrow for a match likely on Tuesday against Bedene. Watertight on serve and rock solid in all other areas. The better player over both sets with more explosivity and aggressiveness than Raonic. Now onto business: The match proved what we knew in advance. Take the first serve away from Mr. Milos and what’s left is a middle of the road player. Yeah, a few decent volleys but to make them, you must get there first: being Godzilla moving around on caterpillars does not help, sir. Yeah Raobot not the best, threat at Wimbledon though with his serve + forehand. If he connects with 1 or 2 then always got a chance to break serve. It’s already on AutoTrader. 15 miles on the clock. Majestic Roger!! Kudos for the #98th!! Oh, what?! Couldn’t he just have stayed in Germany and watched it in his hotel? Does he need the distraction? I can see that being used as an excuse if he doesn’t win Halle now. Yeah not sure what works out best, 2 hour drive back to Zurich or a 4 hour drive to Halle from Stuttgart. Flight probably 1 hour 30m tops. Dunno which airport he goes to though as Dusseldorf is the main one in the area. Guess maybe he charters his own for something like that though Zurich to Bielefeld or Munster Osnabruck. I’m thinking his family is going with him to Halle? Well he does have a family that he hasn’t seen for a week?I wonder if they will be in Halle,it must be increasingly difficult to keep taking the children out of school as they get older,or perhaps they are taught at home. The children have tutors. Fed has said it would be too disruptive to have then going in and out of school. “He’s simply the best, better than all the rest”…He’s the Stuttgoat ! “And nooooobody does it better…………nobooody does it half as good as he………” . Hope he carries his form into Halle! It would be good to get the 100th at Wimbledon, wouldn’t it? Thanks so much Jonathan for the very good work throughout the week 🙂 . What a bang to kick start the grass court season. 🙂 🙂 🙂 . Long may this continue. It seems that Halle’s draw appears to be slightly kinder. If Roger carries on playing like this, there should not be any surprises on Sunday with 10th Halle Trophy. I also wish that both Nick and Milos are in someone else’s half in Wimbledon draw 🙂 . Yeah Halle draw looks pretty good. Can all change though. Bedene isn’t bad on grass, quick and hits nice of both sides. Very interesting resume of the match Jonathan. Nick was the big roadblock in the draw I think.Once over that the way to the title was clear. court season.So nice to see Roger playing so well,except that I didn’t see him but you know what I mean. Sky won’t have any next year. Thank you for that,I’ll give it a go.? Nice to see a trophy here. Well, not this trophy! It looks like a tombstone for a cat named Mercedes. Awesome week of tennis, nice write-ups and insane to think it will be the 10 yr anniversary of the “greatest match” this year. Wonder if Wimby will say anything about it. Getting ahead of myself here. On to Halle and #10! A great take on that trophy! I actually don’t mind the trophy, just a simple design, nothing too flashy. Wonder what he will do with the CLS 450? I don’t see it as a trophy for tennis. I see an ad for Mercedes. I know it’s the sponsor but tacky to me. Almost all tournaments have sponsors but I don’t see the AO trophy a block of the Kia logo. Yeah I guess it’s a bit commercial but the whole thing seems very Mercedes orientated anyway, like almost the tournament organisers the way its branded. I think if Roger had to start over he realizes that clay court wasn’t worth playing and he should have just stuck to hard court and of course grass. But I guess he needed one French Open on his resume. But this skipping clay season has been working for Roger and had he started this earlier in his career he might be at 115 ATP wins. And probably 22 slams. But he is the greatest of all time. And the greatest of all time needs to be playing at all times. Agree, he would probably won that much or more, but guess what he was such stubborn, needed that elusive RG win over Rafa playing his style of tennis. Had he skip some at earlier stage, who know what would happen. When Roger was knee-healthy he played all the GS tournaments and in fact had a record number of consecutives..would have to look them up but 36 consecutive GS QF, 23 consecutive GS Semis and 10 consecutive Finals. He didn’t shirk tournaments, and 72 GS appearances is not bad. When his knee cracked that is when he had to take the break from tournaments, and he has had to skip hard courts as well as clay. I can’t take this any more guys. My forever favorite soccer teams against my forever favorite tennis players national team. Maybe a draw? You are a Brazil fan, too! How wonderful! No, no, no draw please. Fed has just won a tourney, let this be Neymar and the samba boys. Swiss are horrible. I lost count of how many yellows they got. Why was that Swiss goal allowed? He clearly tugged and shoved the defender. Brazil aren’t the Brazil of old. No flair at all. So happy he won this but the marquee match was vs. Nick. Grass does look lovely after all that brutal clay-play that makes me tired just watching! Woohoo, no. 98! Calm and sharp Fed, so awesome to watch. Yep, some of the half volleys from the baseline were unreal. Only he can produce such a shot of pure instinct. Can’t help but wishing for no. 99 in Halle and no. 100 in Wimby :0 Greedy, I know. Thanks Jonathan, you did a great job again. Both Fed and you, keep going on the grass swing! Oh, Wanda agree completely. That’s what we all wish no more secretly. And it seems possible from what we’ve now seen of Fed’s galloping solidity and fresh precision. Thanks Jonathan for your report and giving us a forum to chat tennis. Couple of thoughts. I watch all matches (except grand slams) on tennis TV, which is an online provider for 119 US dollars per year, not for sure if it’s available in Europe but it helps me get access to Fed matches. Second, what are the 18 grass tournaments, I assume 8 Wimbledon, 9 Halle and 1 Stuttgart? I would have thought there were more. I also watch on TennisTV and have subscribed since they first started about 3 years ago. I split it with a friend so we both watch on our own devices. I am in Indonesia and it works brilliantly. I love it especially for the chance to watch old matches back to even before Roger! I use Tennis TV too. Maybe Amazon is something to consider next year though. Yup, those tournaments exactly. There aren’t any more to play, unfortunately. Total time on court very little though. So no worries really. Holding onto number 1 is still perilous for Fed. Even if he wins Halle and Wimbledon, Nadal would move back to number 1 if he gets to the quarterfinals at Wimbledon. Even getting to the quarters will be a challenge for Nadal.It all depends on the draw,let’s hope he gets Muller,Schapo ,Del Potro and Cilic.But knowing Feds luck He will get them? Had to do a quick anti-jinxing spell . with the draw and can get to the quarters to wrestle back the number one. I want him to win Wimbledon, don’t care about number one any more. But unfortunately this time the two come hand in hand so I guess we’ll hear a bit about it! Memories of a great 4th set tiebreak. Why are you bringing up a loss?! Well, it came up somewhere. This is the only bit I could watch from that match. My love for Fed and dislike for Nadal was cemented here. Can’t believe ten years have passed. Switzerland did not lose a match on grass yesterday. I wanted them to win. Neymar going down way too easy. World Cup quite interesting so far. Good start to grass season, lots of good info for Roger to digest. Short recovery time for Halle but think he is in good shape as mostly quick matches. Yeah should be fine after so long off. when they play,though I guess they haven’t played on grass for a long time.Thank goodness ? Grunting in men’s tennis is horrible. I’m used to it in WTA and even am a bit of a Halep fan, she’s not quiet. But because the GOAT of men’s tennis is quiet, that is just right. Imagine if Fed made a noise every time he hit the ball! Awful! So unlike his playing. Roger starts playing today. Bedene is a good match-up to start with. Well-rounded play but lacks real weapons. Then hopefully rest on wednesday and Roger will come fresh to compete for the title. The only thing I didn’t like in Roger’s tennis in Stuttgart was his low ace count and relatively low unreturned serves count. The free points are important to avoid complications on serve. Roger did well on serve overall in Stuttgart but it might not be enough later on. So I hope it is improved in Halle and Wimbeldon. I’m less worried with his break point conversion rate, because grass gives an advantage to the server. Holding break points promise you nothing because the other guy can blast aces or powerful serves and take over the point. As for tiredness, I’m with Jonathan on this. Not a lot of time on court for Roger, and the games are very short, plus he favors the surface and it is less demanding for Roger than hard courts. 16 straight matches is possible, Roger has done that this year and last year. If he wins every match or gets to all finals, it will be 16 matches in 33 days. In comparison, the first bulk of matches was 19 matches in 64 days (AO, Rotterdam, IW, Miami), but he traveled across the globe and had other events just before tournaments – Match for Africa (IW) and LC promotion (Miami). Now travel time is quite minimal, and I hope he doesn’t have too many commitments. I think if he passes the match today in a good way, the rest will be easier. He said so in his interview yesterday. Thanks a lot, Jonathan, for last week’s write-ups and opinions, very informative and enjoyable. Thanks also for your previous post on TennisTV which I had never heard of but which we now watch avidly. What did you think of the commentator all week? I don’t know who he was but he was obviously Roger’s greatest fan. I found his comments rather amusing. As for Halle, we are all waiting here for Roger’s match. It seems possible that he might get to the final fairly easily? – the best draw I’ve seen so far. It will be also interesting to see how Murray plays against Kyrgios. I’m not Murrays’s greatest fan but maybe he adds a different personality to the tour. By the way I was very impressed with Raonic, he seemed to be enjoying playing, played quickly without a fuss and was a pleasant person on court.